Willing Volunteers are Vital to our Success. There are a number of ways to get involved. Educating the public is our first priority. We have within our Visitor Center exhibits, displays, and dioramas depicting the evolution of Clear Lake, the Indians who settled the area, and the wildlife that abounds here. School groups regularly schedule visits to the Park, there are nature walks during the four distinct seasons, and speakers with background on a variety of subjects are scheduled throughout the spring and summer. Clear Lake State Park Interpretive Association is governed by a board of directors who hold monthly meetings with the park staff to discuss what is needed to improve the park and assist them in their duties. We publish a newsletter sent to members, maintain a website, and hold various fundraising events at the park. 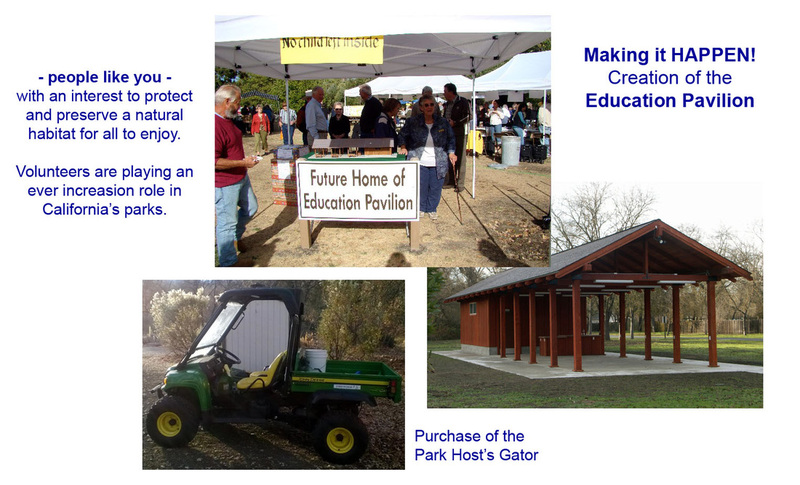 Recently CLSPIA has funded an educational pavilion, purchased a "gator" for wood deliveries, and constructed a shed to protect the wood that is sold from the elements, along with monetary assistance to fund the Interpretive Aide position at the park during peak times. We always are looking for new ideas and new members.